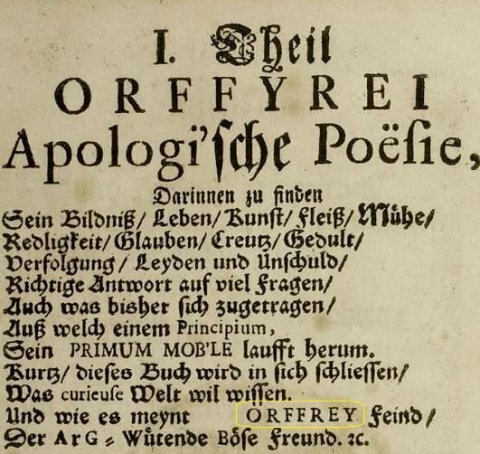 As the second revision of the Merseburg drawing had a clear numbering error, the first page of "Apologishe Poesie" contains a major spelling misstake. ORFFYRE is spelled as ORFFREY. It is almost impossible that the inventor spelled his name wrong in the first page of his defence book. We also notice an unnatural and odd gap with no apparent reason just before the misspelled name "ORFFREY". Why would Orffyreus do this? Would he publish a defence book, defending the worlds greates treausure, and not even being able to spell his name correctly on the fron page? Was Orffyreus a genius writing in code, or was he just another fool?